Remember on Recovery when Eminem straight up said, “Them last two albums didn’t count/Encore, I was on drugs. Relapse, I was flushin’ ‘em out?” While Recovery may not be the definitive album in Marshall Mathers’ catalogue, it was really great to see Eminem own up to two albums that were really just subpar, and that album was followed by Eminem’s best album in 11 years. Revival was a serious misstep for Eminem, and while there’s a certain excitement and viciousness in Kamikaze, it’s an even bigger one. The declarative statement of Kamikaze is: even though Revival was panned, Eminem is still the best at what he does, and he’s here to show you. The problem is that Eminem’s old work hasn’t aged super well, and he’s grasping at straws to show his technical skills to an audience that wants dope beats and emotions. Eminem’s rapping is impressive, but it’s mostly without feeling. Eminem just comes across as someone trying too hard. The most engaging moments are when Em actually sounds pissed off. The “Paul” skit isn’t funny and ironic. It actually sounds like Paul [Rosenberg, Eminem’s longtime manager] is legitimately warning him. Eminem uses his own take on trap beats, but they just sound weak. They don’t fit his style, and he needs to tweak all the elements people like about those sorts of beats to be able to rap over them. It makes a song like “Not Alike” that much more pathetic sounding. He goes out of his way to talk about how he’s so much better, but he only offers a weak imitation of what the kids are doing. Eminem’s angry old man energy can be engaging: the opening verse of “The Ringer” is pure vitriol, but then when he tries to act like Slim Shady on “Greatest” it just sounds like someone complaining on a YouTube video. He also shows that he’s growing into the type of middle-aged person who you try to defend with saying things like “You ain’t never been charged in connection with battery,” as if it was something to be proud of. He also wastes a Justin Vernon feature and a pretty decent beat just to blurt a homophobic slur at Tyler, the Creator. Still, these are the sort of things we expect from Eminem, which is why a large portion of his early and best work hasn’t aged very nicely. Eminem’s largest mistakes are in the real head-scratching moments on the album. The first is the inclusion of “Nice Guy” and “Good Guy.” Both have some of the best production on the record, but they come right after “Fall,” what should have closed the album. They both should have served as interludes. “Nice Guy” could’ve been fleshed out into an actual song, as it has the most in common with the trap that Eminem is trying to emulate. The inclusion of “Stepping Stone” and “Venom” are also strange. “Stepping Stone” doesn’t fit any theme that Eminem was trying to establish-a weird love letter/apology to D12, and “Venom” is a bad song for a movie soundtrack. Still, on top of the homophobia, random shots taken, and Beastie Boys album cover, the strangest and most cringeworthy moment is the title track. 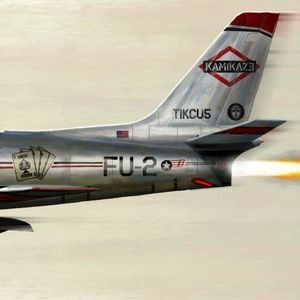 “Kamikaze” is a sequel to “Fack,” perhaps Eminem’s worst song. The beat is headache inducing, Eminem’s rapping is boring, and it sounds more phoned in than the original songs from Curtain Call. Where Revival was boring, it made sense. It was the serious political Eminem album. Kamikaze is a goodie bag full of rotten candy from a party you didn’t want to go to in the first place. Eminem uses all his usual tricks while trying to recapture some of the fury of his early albums. Still, Marshall Mathers is a multi-millionaire; he doesn’t need to win like he did on the first two albums. Now, he’s just defending a title that no one cares about. He’s concerned with being the best MC, which he is, but he forgot that virtuosity doesn’t write songs. He can rap circles around any rapper today, but I don’t want to listen to it.